This article is about the Fritjof Capra book. For other uses, see Turning Point. 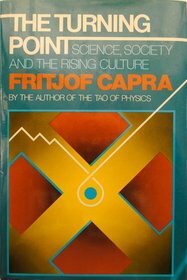 The Turning Point: Science, Society, and the Rising Culture is a 1982 book by Fritjof Capra written to examine perceived scientific and economic crises through the perspectives of systems theory. Capra begins by outlining and tracing the history of science and economics, highlighting flaws in the Cartesian, Newtonian, and reductionist paradigms which have come to light in the context of more contemporary empirical understanding of the physical sciences. He narrates how such viewpoints have grown inadequate to guide human behavior and policy with regard to modern technology and ecology, then argues that science needs to develop the concepts and insights of holism and systems theory to solve society's complex problems. The 1990 film, Mindwalk, is based on the book. This article about a science book is a stub. You can help Wikipedia by expanding it. This page was last edited on 12 November 2017, at 06:52 (UTC).